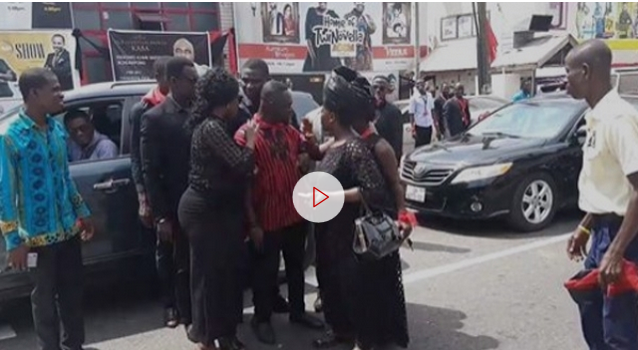 Popular television and radio sports host, Countryman Songo lost his cool at KABA’s memorial service held at the Multimedia's headquarters, Accra. The presenter who is known for his vibrancy and peculiar style of presenting was seen in a very still mood. Songo amongst others could not hold their emotions at the sudden death of their work colleague. The ‘fire man’ rushed to stand in the middle of the road calling moving vehicles to run over him. Unable to bear the pain of losing a loved one, the ‘fire man’ wanted to end his life. But he was quickly yanked away to make way for the passing vehicles by Adom FM’s news editor, Afia Pokuaa and co-host of Badwam, Nana Yaa Brefo and Akuma Mama Zimbi. The ceremony was well attended by politicians, celebrities, family and many others. The death of Kwadwo Asare Baffoe Acheampong popularly known as KABA a political show host on Asempa FM was announced over the weekend. It is believed he died of what doctors suspect to be hypoglycemia (low sugar level), which he suffered as a result of being diabetic with a combination of high blood pressure (BP).